A common feature of armies both of Christendom, Islam, and Hinduism are the entourage which a marching army brings - ripples of man and animal from the parting of once peaceful waters. When faith is a driving force behind the motions of such armies, whether battle be for sectarianism or religious divide, the fanatical rise like shadows under the sunset. 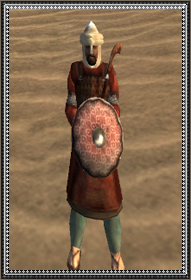 Driven by desire of plunder and piety, their descent is like that of the locusts as do their numbers swell, often much to the dislike of those commanding the armies they cling to./n/nA term meaning "Rabble", the Harafisha are less a militia of any organization and more a mob bearing simple wooden club and either no armor or the lightest of it. They are less They will melt away quickly though confronted with cavalry or foot soldiers of better worth and discipline, and are best served in a role of supporting better troops, being a distraction, or simply adding mass to one's army.